Title: 'Penisola dell'India di qua dal Gange et Isole intorno ad essa adiacenti'. DA GIACOMO CANTELLI DA VIGNOLA. 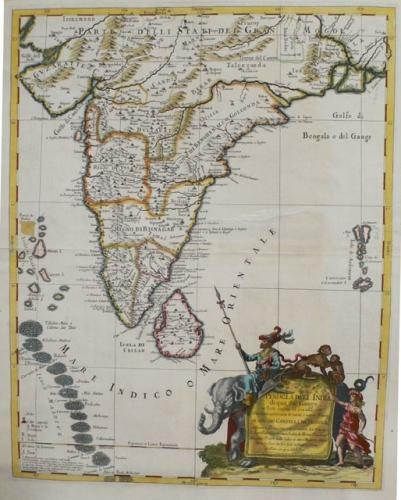 This is an uncommon map showing the southern part of India, with Sri Lanka and Maldives, from "Mercurio Geografico", published in Rome by G. de Rossi. A very nice cartouche with elephants and monkeys. The Italian cartographer Cantelli introduced a style in cartography that was followed and developed by Coronelli. His maps are very attractive and finely engraved, with elaborate decorations.